RSS supremo Mohan Bhagwat continues to wrestle with caste, diversity of faiths, cultures and languages, and economic contradictions while pitching for a monolithic vision of Hindu India. Addressing a rally of swavamsewaks (members) of RSS at Meerut in Western UP on 25 February 2018, Mohan Bhagwat, the RSS supreme leader, displayed all the fears and contradictions in the RSS ideology that have dogged its steps since inception. He is currently on a tour of UP, having addressed similar meetings in Varanasi and Agra. 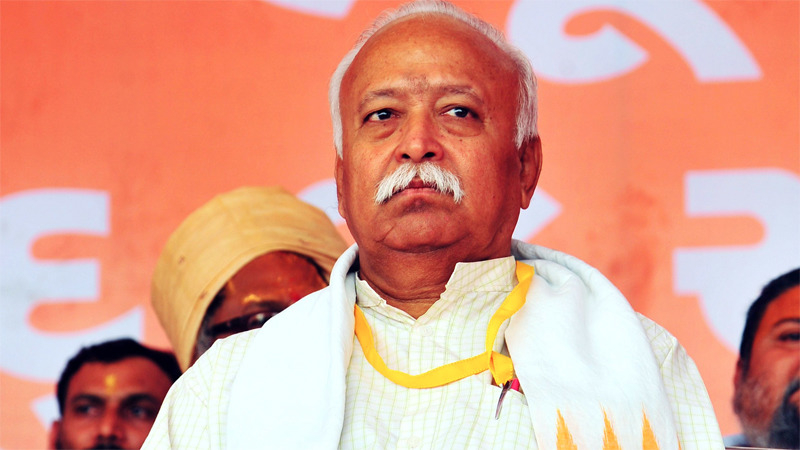 It is being speculated – and with much reason – that Bhagwat is on a mission of setting up his Hindu fanatic and ultra nationalist organization for the upcoming 2019 General Elections. However, he had nothing new to offer his cadres except the same old assertions to answer the same old riddles. After waxing eloquent on the greatness of India – which he equates with Hinduism – and that only India can show the way to the world, he asserted that all Hindus should unite. Then he came to the problem with that. “The roadblock to being united is that we are fighting on the lines of caste. We have to say that all Hindus are brothers irrespective of their community,” he declared. Remember: Bhagwat was speaking only a hundred odd kilometers away from Saharapur where in May 2017 a mob of upper caste Hindus had destroyed a Sant Ravidas temple (revered by the Dalit community), reportedly urinated on his idol and burnt down dozens of Dalit homes in Shabbirpur village. Violence continued for nearly a month. Chandrashekhar, head of a Dalit organization called Bhim Army was later picked up and now languishes in jail charged with the draconian National Security Act. Clearly, Bhagwat is attempting to stitch together the torn fabric of the favorite RSS dream – a ‘united’ Hindu nation. But he is unable to voice even a word of sympathy or succor for the victims of upper caste atrocities in Saharapur or elsewhere. In the past few years, there has been a wave of barbaric incidents of such attacks on Dalits. In Una, Gujarat, four dalit youths were stripped, mercilessly beaten and videographed pleading for their lives by upper caste hoodlums sparking protests all over the country. They were ‘accused’ of going about their traditional vocation of flaying fallen cattle, a task reserved for outcastes in Hindu society. Since then there have been at least 30 attacks on those transporting cattle or involved in the lifting of cattle carcasses, in the name of another the sacred cow. Dalits were viciously attacked in Koregaon Bhima, Maharashtra, recently by Hindu fanatics. Dalit students have committed suicide due to brutal discrimination coupled with deprivation – Rohith Vemula to K.Sai Deepthi. Atrocities registered with police have increased to over 40,000 cases in 2016, NCRB data shows. And yet, Mohan Bhagwat sheds no tears nor has words of concern for Dalits. His sole obsession is with uniting Hindus. Bhagwat is, of course, taking advantage of Narendra Modi led BJP rule at the centre, to spread the poisonous vision of RSS as much as possible till the govt. lasts. And, he is also trying to prepare the ground for the forthcoming elections. But, will the wounds of Dalit communities heal just by asserting that “all Hindus are brothers irrespective of community”? Bhagwat is expressing the core fascistic tenet of RSS philosophy. In plain English this means: Hindus are a majority in this country, this is their strength provided they are united, even gods will have respect for you if you become a proud Hindu and unite with all other Hindus. Needless to say that one of the most direct results of this fantasy will be that the BJP will win all elections. Other results will include the cowing down or even elimination of minorities (religious, linguistic, ethnic and others) and of course, the elimination of all dissent. He spells out the logical absurdity of this himself: “the whole society will have to become RSS, there is no alternative”. To Bhagwat, the best case scenario is when the whole country is organized on militaristic lines, united by religion, led by a fascistic ideology that they are superior to all ‘others’ and ready and willing to finish off any dissenters. Even while asserting these fantastical visions, he was also trying to wriggle out of various contradictions he faces. He tried to make a virtue of the accusation that RSS is fanatic (kattar) by saying that “being a kattar Hindu means udarta (being liberal)” and also that it means “kattar ahimsa (fanatic non-violence)! Bhagwat’s incredible sophistry only shows that RSS is feeling the pushback deep down. Continued protests at its violent and incendiary activities – the armed processions and provocations, the attacks on Dalits and minorities, the spread of hatred and venom – is making them nervous that it will damage election prospects. Hence these childish attempts to explain it all away by word juggling. In its long 73 year old history, RSS has never learnt, never tried to change for the better, and never questioned its own tenets. They live in a time warp – and want to drag India back with them. That’s the real message from Mohan Bhagwat.